So many folks have read, reviewed, and loved this one, that I am not sure what I can add. It is the first time I have read anything by E.M. Delafield and I certainly enjoyed it. 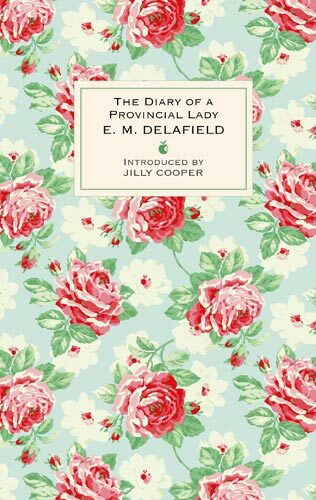 Written entirely in diary form, Delafield chronicles the life of this provincial lady (do we ever learn her name?) in a way that humorously describes all the little details that add up to a life. The diary entries brilliantly capture the episodic, shorthanded cadence so typical of how one thinks about things. Not always in lovely complete sentences, but short bursts of thought, like thousands of brain synapses firing directly onto the page. There is much that made me chuckle in this book. And of course I love a good bit of domestic detail and this book does not disappoint on that account. The Diary of a Provincial Lady has all the hallmarks of the upper middle-class (lower upper-class?) in 1930s Britain where appearances trump everything from budget to happiness. And the inevitable shortage of servants and overdrawn bank account. One of the more amusing reoccurring themes is the tendency to talk about things one knows nothing about: exhibitions not seen, places not visited, and most of all books not read. Am asked what I think of Harriet Hume but am unable to say, as I have not read it. Have a depressed feeling that this is going to be another case of Orlando about which was perfectly able to talk most intelligently until I read it, and found myself unfortunately unable to understand any of it. Although I enjoyed reading this very much, there was a huge part of my middle-class, American, OCD brain that kept wanting to “fix” what was wrong in the lady’s life. First, her inability to remove herself from social situations that are unpleasant. The constant struggle to impress Lady B, the friends who invite themselves over to stay for a few nights, etc. Just say no dammit. Then her inability to live within her means. It is no different than the legions of people today who live a life of economic lies. Buying things and going into debt for a lifestyle that can’t be supported. Here is an idea, take Robin out of school, put him in the local grammar, get rid of Mademoiselle and take care of your daughter yourself, (and maybe let her go to school as well so that she doesn’t end up unable to make her own living one day) and quit wasting money on bulbs and bulb supplies. Little things add up and you can’t afford it. And for goodness sakes take that 500 pound windfall and pay off as many of your creditors as possible, why should the hard work of tradespeople go uncompensated just to support you in your lofty lazy life? BUT, I know this is not in the spirit of the book and I shouldn’t really apply today’s reality to yesterday’s fiction, but therapy can only do so much to cure me of wanting to fix people. Looking for a light, fun, Anglophilic romp of a read? This one is for you. I like the quote about Harriet Hume especially as I found that book a bit incomprehensible – I'd forgotten that she mentioned it! I love it when books crop up in other books. Oh you are funny Thomas! I agree – as much as I love the Provincial Lady – there are three sequels! – she does need a good talking to about priorities. However, her life gives an excellent picture of the social expectations on women of her class at the time, and how important it was to uphold them. Doing your own cooking and cleaning? Sending your daughter to school before 16? It just wasn't done! Frustrating for us to read about now, of course, with such different lives. But at the time…it was their 'normal'. I just can't imagine it! Verity: I liked Harriet Hume, but did find parts of it confusing to say the least. It is especially fun when the books that crop up in other books are books that one has read. Book Snob: See, I was even willing to let her still have a cook and a maid…which brings up another question: Was there really no labor pool in rural England in the 1930s to fill household positions? There are more than a few books that touch on this. And you'll be pleased to know that Vicky *does* go to school in the second book! And yes, The Servant Problem (as it was called) was a big deal – women who'd done war work were understandably reluctant to be maids again after the war, and could get jobs in factories etc. with the same pay and more self-respect. I find the whole evolving status of servants in the period really interesting. I love the provincial lady complete with her financial woes, maybe even because of them – I find the whole inter war period fascinating – the clash of pre war expectations with post war reality. I sort of understand the importance of keeping up appearences. I remember elderly relatives and their circle who still tried to maintain standards learnt in the 20's and 30's; as I get older I realise what an impression it made on me. As you may know I was quite a fan of this book. I am trying to remember if you have read Henrietta's War or not? I liked it more than this one I have to say. I haven't read this one but I enjoyed her other book from Persephone called Consequences…a sad though wonderful book. The Provincial Lady sounds completely different. Ah, I really must acquaint myself with the Provincial Lady this year as she has been waiting impatiently on my shelves for over a year (in the lovely edition photographed although I also own it in another volume along with the sequels). Simon T: The quibbles I have with the book don't even rise to the level of reservations. More an observation of my own foibles. I guess I would have thought in the wake of the Great Depression and before the build up to WWII there might have been a labor surplus. Desparate Reader: I guess I find keeping up with appearances rather trying. It puts so many people in such difficult, unhappy positions. Simon S: I liked Provincial Lady much more than Henrietta's War. I think the writing in the Delafield is clever and funny rather than cute and cozy. Mrs B: I am very interested to check out Consequences. Paperback Reader: I actually own a different edition which has several illustrations of some of the characters. Does your edition have illustrations? Emily: It is a quick fun read, you will have it done in no time. I've also had this on the shelf for awhile. I'm afraid it won't be my thing; I have trouble with the diary format. I will try this one day! Tara: I found the diary format pretty easy to get into. Thomas, no photographs in my other edition :(. It's the older green Virago one. Paperback Reader: Well you know I only read picture books…LOL. I love the PL. Like Simon, I'm fascinated by the whole between-the-wars social upheaval aspect. But, I also find her funny & endearing although I see your point about her unsustainable lifestyle. I'm glad you enjoyed it. Consequences is completely different. Stunning but an emotionally wrenching read.